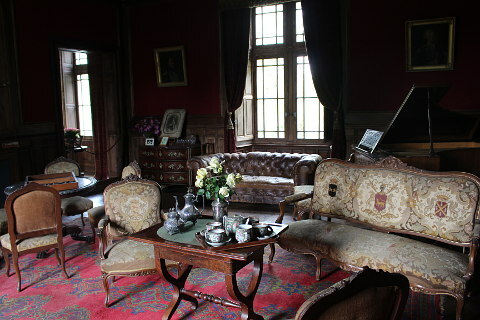 The Chateau de Bridoire has been restored and furnished relatively recently (2011/2012) and is now open to the public after years of neglect. As well as various rooms decorated and furnished to reflect its historic past it is brimming with both indoor and outdoor games that you can play during your visit. 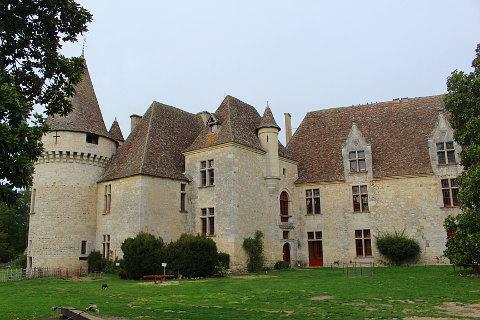 The chateau dates back to the 12th century and has an attractive facade with stone walls, deep perigordine roofs, turrets and extensive grounds. Many of the rooms have been renovated and furnished allowing you to step back in history. 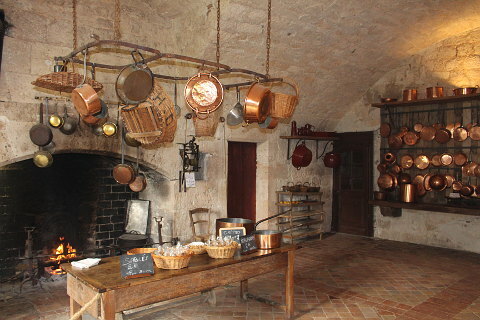 The kitchen is a large room with a domed roof and a huge open fireplace once used to cook the meals for the chateau's inhabitants. 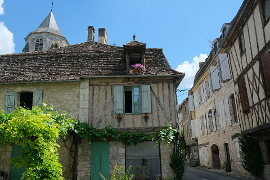 Now it is often used to make crepes and biscuits that you can buy. Hung on the walls and ceilings are an assortment of copper pans and various other kitchen utensils are on display. The elegant dining room lined with gleaming wood panneling has its large table set as if ready to entertain at any moment and a large and elegant salon also has lovely wood panneled walls. 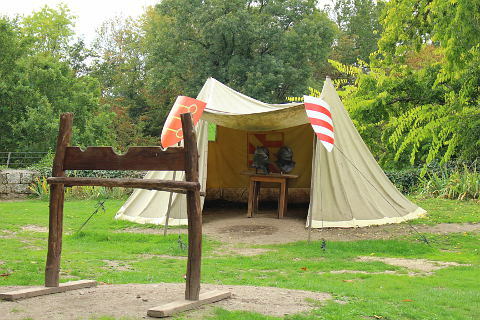 Other rooms include a games room, an armour room with a full knight and horse's armour and a bedroom. Down in the stables is a large games room and outside both in the courtyard and outside the castle there are loads of games to play. 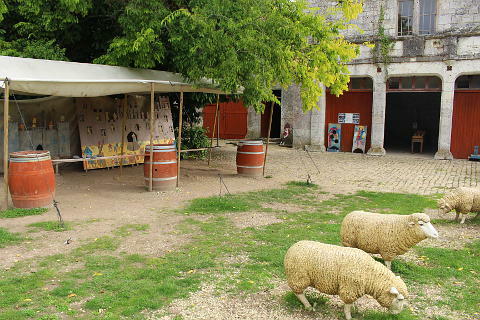 These are all traditional games and make the castle a great place to come with children. 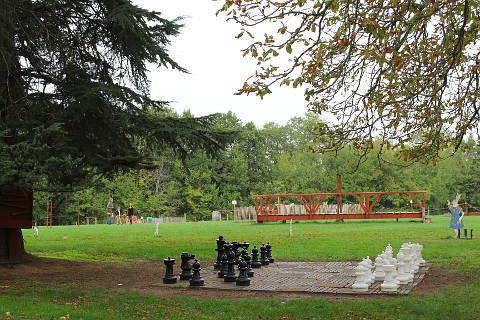 Games include giant chess, archery and many games of skill, strength or dexterity. 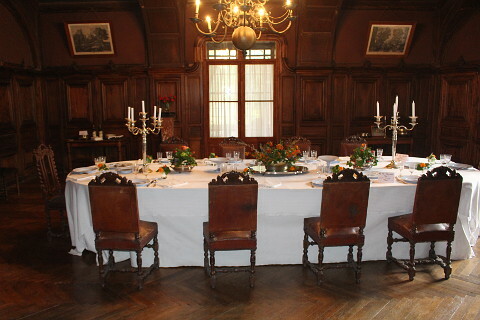 In July and August there is a restaurant in the courtyard of the chateau with a simple but tasty menu of quiches, sandwiches, salads and cakes, crumble or ice-cream. In 2016 the Chateau de Bridoire added a new attraction - a walk through a forgotten valley where along the way you will encounter mysteries, challenges and also a labyrinth, troglodyte ruins and ancient ruins. 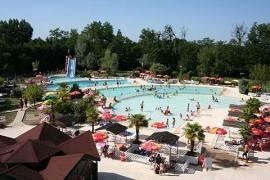 Prices are 8.50 € for adults and 5.50 € for 5-12 year olds. Under 5s are free. The chateau is open some evenings when prices are 10 euros and 7 euros respectively. The Mysterious Valley costs 5.50 € for adults and 3.50 for children or tickets can be bought more cheaply in combination with a visit to the chateau. 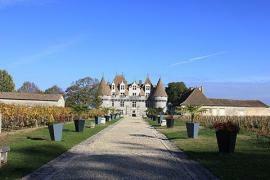 The Chateau de Bridoire dates back to the 12th century and has had 10 diffferent families living here. 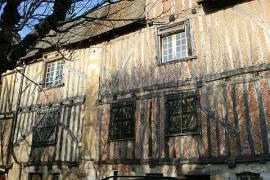 It was once visited by Henri de Navarre before he became King Henri IV of France. Fighting has taken place here between the French and the English and between Catholics and Protestants. In recent years the castle was vandalised and plundered for 22 years before it was eventually protected by the state and bought by the Guyot family who renovated the castle and are the current owners. 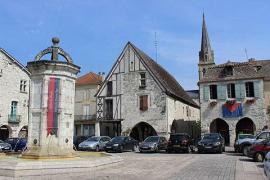 The lovely medieval town of Bergerac is just a few kilometers away as is the ancient bastide town of Eymet. 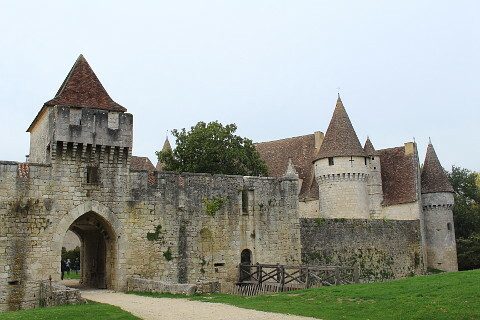 Wine lovers will want to visit the Chateau de Monbazillac and sample their famous sweet white wine which is great for apperatifs.